I’m seriously in denial that I have not only entered my third trimester, but hit the 30-week mark. This is pretty much the home stretch. It’s doctor’s appointments every two weeks now and I’m feeling every bit of 30 weeks pregnant. Most people assume I’m so over the heat (it’s actually been in the 90s here in Milwaukee) and that I’m ready for this pregnancy to be over with. Actually, not at all. Maybe if I didn’t spend most of my day in an air conditioned office building I’d be bothered by the heat, but unfortunately I do. I’ve just been taking it easy when outside on the weekends and after work. Drink lots of water. Sit in the shade. It’s not that bad. And I’m definitely not ready for this baby to come just yet. My due date coincides quite inconveniently with a big project I’m working on at work, so my growing belly is a constant reminder of the time crunch I’m under to get it done. Take your time, child. You have my permission to come a little late, even. But not too late. Work projects aside, I’m eager to meet this little one. The first few days of Corban’s life were the most amazing days of my life thus far, and I look forward to experiencing that unmatchable joy again. And… boy? Girl? Which will it be? What will he or she be like? How will he/she fit into my heart and into our family? I can’t wait to know the answers to those questions. Yup. The belly is large. I swear, this happened overnight. I think my feet are starting to swell a bit (last time they got scary swollen near the end), but I can still get my wedding rings off without a problem, so +1 for that. I have the unfortunate luck this time of being plagued by the dreaded mask of pregnancy, a.k.a. dark spots on my face kind of like sun spots (they get darker in the sun, too). And, yup, on my upper lip. Awesome. And a little on my nose, which isn’t so bad. On the plus side, my eyes haven’t been as itchy as they were with Baby #1. I do think I’ve developed a mild pregnancy-induced allergy to our cats, though. I thought maybe it was just general pregnancy congestion and sneezing, but it magically went away while we were on vacation for 10 days, and came back as soon as we got home to our kitties. Side note: when I was pregnant with Corban I couldn’t imagine loving any baby more than our fur babies. Now I can’t imagine how I possibly felt that way. The poor cats have fallen far in household hierarchy. My energy levels were high for all of the second trimester, but not so much anymore. I’ve hit the point in pregnancy where every morning feels like a hangover, and no amount of sleep feels like enough. Getting out of bed is an undertaking, and I usually am short of breath for the first minute or so. This baby is active! I enjoy lots of kicks. Fun. My skin has been much better this time around. It was really bad when I was pregnant with Corban – embarrassingly so. I don’t know if it’s just different hormones or if the fact that I started washing my face with a Clarisonic brush has made a difference, but I am so thankful that I haven’t had too many skin problems with this pregnancy. My favorite pregnancy side effect this time is that I can go days without washing my hair… and it doesn’t get greasy. It saves so much time in the mornings, only having to wash my hair once every 3-4 days. We went on vacation to Branson, Mo., with Peter’s family over the 4th of July, and I encountered some of my first physical limitations of this pregnancy. We went to Silver Dollar City, a theme park – no roller coasters for me. Also, pushing a stroller around on those hills in the heat is brutal. One morning Peter and I played 12 games of tennis. Bending down to pick up balls was not much fun, but otherwise it was great. Until the end, when I suddenly felt like I was going to either pass out or throw up. And I thought nothing of signing up to play on a sand volleyball team in the bi-annual Sherwood family tournament (at their family reunion). Of course I would play. But the day of the tournament was 90+ degrees and sunny and, honestly, I wasn’t disappointed when I was told not to play. Sitting in the shade felt like a killer workout that day. Time to come to grips with the reality that I can’t do everything I normally can. Although that probably won’t stop me from trying…. (tailgating at two Brewers games this weekend and planning to go camping and canoeing in a couple weeks). 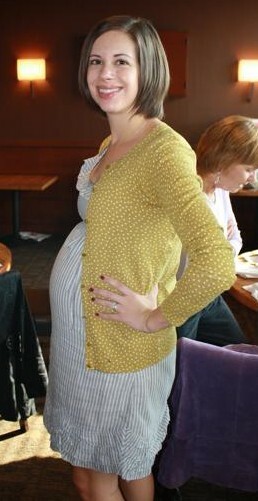 At 30 weeks when I was pregnant with Corban, I had my first baby shower! I think the bump looks smaller there than my current bump, but that dress can be deceiving. Last time at this point, I had gained 18.5 pounds. I was up 16 pounds at my appointment last Friday, but I still think I feel bigger this time. Or maybe it’s just the heat. awww…how precious is your blog. love the idea of starting a new adventure every so often because life is all about adventures. and the baby bump series….so cute! congrats! Although I don’t know if you will find it as helpful with baby #2 as I did for baby #1, but it was my go to book during pregnancy. Thanks – I haven’t heard of that one so will have to check it out!